How The Browser Market Share and Google Chrome will Look after Live Chat addition? As per the details provided by Google, Chrome is expected to get native audio and video parts which means you will have fully capable video chat application inside the browser. This is definitely a warning alarm for services like Skype. And once this capability will come in Google Chrome, the similar application is expected in Android’s browser as well which is again a bad sign for other chat services for Smartphone. Google Chrome is currently having around 20% global market share where Mozilla Firefox is at around 30%. With features like Video/audio chat, instant pages and TV commercials/Print Media marketing, by end of the year, it is expected that Chrome will replace the Mozilla Firefox from #2 position. IE is having 44% global market share at this time. As WebRTC is an open source project, you can expect this thing in other browsers like Firefox, Opera as well in coming days. But again, the speed factor of Google Chrome is definitely going gain more users. The video/audio chat capability will also be there in recently launched Chromium OS as that OS is having the latest version of Google Chrome browser only. Don’t worry! Skype is no going to shut down. Yes, they are going to lose some market share and will see a tough time before they come up with some new features and plans. Chrome will attract more users to chat through the browser itself where they spend their maximum time. I am expecting that Google will add capability to chat with other IM IDs as well, and if it happens then the problem will be much bigger for Skype. 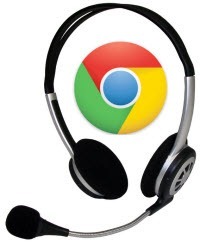 Get more details and technical aspect about codecs used in Chrome Video/Audio chat. Next Story → Unlimited Photos and Videos Storage on Picasa!